There can be no doubt but that persons have followed in the wake of the Federal armies, falsely calling themselves soldiers, and dressing in soldiers’ clothes, for no other purpose than thieving. The crossing of the army into Virginia has afforded these gentry a fine opportunity to practice their profession. They generally confine their business to the stealing of horses, quite a number of which have recently been taken from persons residing near the river on the Virginia side. 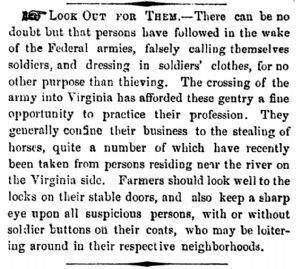 Farmers should look well to the locks on their stable doors, and also keep a sharp eye upon all suspicious persons, with or without soldier buttons on their coats, who may be loitering around in their respective neighborhoods.